The soccer gods smiled on the Milwaukie Mustangs during Tuesday night's Northwest Oregon Conference girls' soccer rivalry game against Putnam. They were less kind to the Kingsmen. 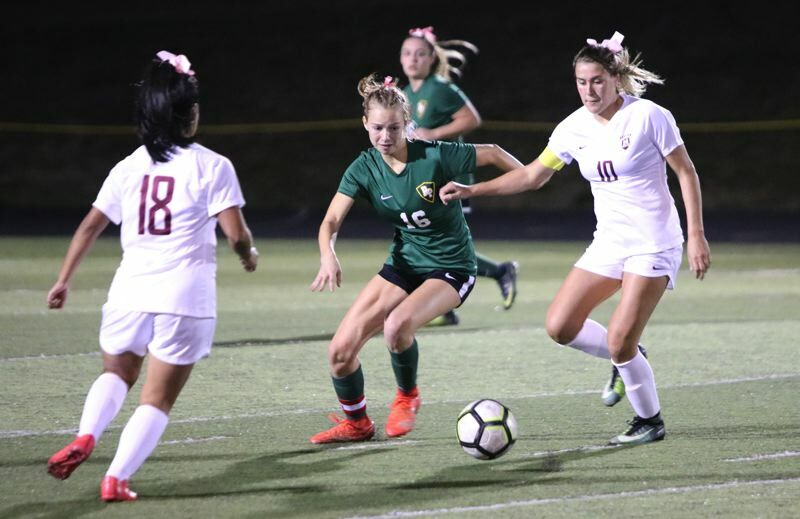 After Putnam had two goals nullified by offside calls, Milwaukie's MaKenna Presley scored on a shot from about 20 yards out in the 75th minute to lift the Mustangs to a 1-0 victory at Putnam High School. "As I said to the team, 'It was a wonderful goal,'" Mustangs coach Kent McCarty said. "MaKenna got on a ball and did what scorers do -- score when it looks as if they're never going to. That was wonderful. "Give her all the credit in the world for scoring that goal." Credit also goes to freshman midfielder Vanessa Cuevas, who kept the play alive in the right corner of the attacking zone, centering the ball to Presley near the top of the 18-yard box. Presley was under pressure when she put her right foot into a shot that glanced off Putnam keeper Stella Goldsberry fingertips and banged off the crossbar before bouncing over the goal line with 5:10 remaining in the game. "Luckily, the ball just came my way," Presley said. "I got a good glance at the goal, but once I saw the ball rolling to me, I knew I had to get my speed up to get that touch on it. "I hoped that it went in … and it did. I've very grateful for that." The Mustangs (2-6-1, 2-1 NWOC) climbed into a four-way tie with La Salle Prep, St. Helens, and Scappoose for second place, one game behind league-leading Wilsonville, while Putnam (2-7-1, 0-3) dropped into a tie with Parkrose for last place. "It's my senior year and my last time playing Putnam," said Presley, who went 3-0-1 in her career against the Kingsmen. "I think everyone is pleased because this is our rival and we went into this game knowing that we'd have to fight hard." Putnam dominated the run of play throughout the match and appeared to take the lead in the 13th minute when Page Gilroy took a shot from the right wing that caromed off the crossbar and Kyla Miller banged the rebound past Milwaukie keeper Jaden South. The Kingsmen's celebration was cut short by the linesmen holding his flag, signaling Putnam was offside. "They called offside, but there was a defender on the post, so I don't see how anyone was offside," Miller said. Disappointed? Absolutely, but the Kingsmen also were convinced that it was only a matter of time before they'd put another ball in the net. "Yeah, I think we thought we had it in the bag," Miller said. "Even though that goal didn't count, we thought we were still ahead because we were playing so much better than Milwaukie." In the 68th minute, the Kingsmen struck again when Sasha Stumpf lofted a free kick from about 40 yards out on the left wing toward the far post. The ball bounced off South, the Mustangs' junior keeper, and rolled to Putnam's Audrey Meducci, who redirected into the net only to have the goal wiped out by another offside call. "We don't know why that one didn't count," Kingsmen co-captain Sarah Rope said. "The linesman called an offside, but the ball ricocheted off the keeper, so how is that offside? "It's easy to say its on the referee, but I think two really important calls should have been better analyzed." South got shaken up on the play and had to leave the game, giving way to backup keeper Kiersten Charron. Putnam had two opportunities to test Charron with corner kicks in the 70th minute and the 74th minute, but nothing clicked on either set piece, which ended up being the night's recurring theme for the Kingsmen. "Lack of initiative," said Rope, trying to put a finger on why the Kingsmen fell short. "Nobody would do anything to take charge. I don't know, but maybe we downplayed the game and we got what we deserved. If we're not going to score, then we're probably going to get scored on. "We're super-disappointed. I think Milwaukie's walking away feeling really lucky." She got no argument from the Mustangs. "Sometimes, it comes down to a little bit of luck, doesn't it?" McCarty said. "We got lucky at the right time, made the right saves at the right time, and kept our heads and kept powering through. We never gave up." Putnam didn't show any quit, either. The Kingsmen just couldn't catch a break. "It was probably one of our most important games, because we needed this to push up back in the league race," Miller said. "We lost and now we don't know what's going to happen." The teams are scheduled to return to league action Monday with Milwaukie traveling to Scappoose for a 4:15 p.m. game, while Putnam visits Hillsboro for a 7 p.m. game.